Mitchelle Blair, 36, shown here in court, was sentenced to life in prison without parole for murdering two of her four children. 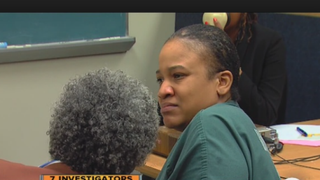 Mitchelle Blair, the Detroit woman who killed two of her four children and stuffed their bodies in the freezer, was sentenced to life in prison Friday and told the judge, "I don't regret none of this. … I don't feel no remorse for the death of them demons." According to the New York Daily News, Blair, 36, will have no chance of parole. She has shown no remorse since the children's bodies were discovered by an eviction crew in March. The children were killed and left in the freezer for years. Blair reportedly killed her "13-year-old daughter, Stoni, in 2013 and 9-year-old son, Stephen, in 2012." Blair claimed that the two children were caught sexually abusing her younger children, although the Daily News points out that she never filed a police report over the alleged assaults. Blair pleaded guilty to first-degree murder in June, and during her trial she confessed to torturing the children before killing them, stating that the "she poured scalding water on the victims, beat them with sticks and put trash bags over their heads," according to the Daily News. "So this was your way of inflicting punishment?" Judge Dana Hathaway asked. During her sentencing, Blair added that she was fine with what she did and didn't care what anyone else thought. "As horrendous as everybody thinks I am—that's fine," Blair told the judge. Blair's two surviving children, ages 17 and 8, have been placed with an aunt, the Daily News reports.